I feel like now everything I do matters! And I hate it. I We can't do anything without it affecting something. Not even our free-time and fun goes without consequences. it scares me. I miss my world of stability. I don't like the real world. 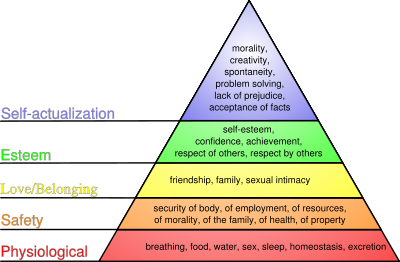 In my human development class we learned about a pyramid of needs we have to satisfy. The needs on the bottom are most important and have to be satisfied before the needs above even matter. I feel like I'm in the safety level. And that all I can think about is security. Which I've decided is so very unfair to Jay. I use him for security more than I do for love/belonging.... it's not fair to him. I mean I do need him for the love/belonging level, and I feel like I've been to that level before, but right now, safety is all that matters. Which, by the way, hurts Jay and puts him down to the trying to find love/belonging level. Hastings, help.... is this a stage that everyone goes through growing up. Feeling like the world is so unstable. That if I do one thing wrong I'm gunna ruin the rest of my life! I hate this feeling, and I want to get past it so I can grow. But how? Poirot, you are just fine. Your entire life will be spent flinging from one level to the other. I have found that one day I'm at the top of the pyramid and the next I am at the bottom. But the wonderful thing about it is that you always get to climb back up! The most important thing: Stop looking at life in boxes! Enjoy where you are, wherever that may be. I think you're doing great brooke-o. I don't think any one person can measure their life by anybody else's standards, either. If more confindence in your life is what you need, I'm sure it will come with time!